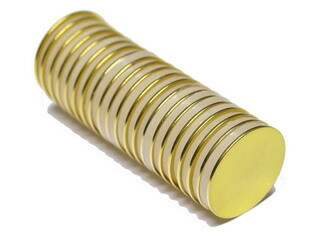 You are buying 1 lot of 20 Neodymium Iron Boron Magnets. Size 7/8"diameter x 1/32" thick discs. Gold (Au) Plated . Grade N45. - Extremely powerful, high quality, magnetic material. The gold plating is an additional corrosion resistant, high visibilty layer on top of the standard nickel coating. Please note: the gold coating will rub off after extensive handling. All neodymium magnets are brittle and can break, especially these disc magnets. Please use extra care when handling to avoid breakage. Also known as "Rare Earth" or NdFeB magnets. Neodymium magnets are simply incredible! Far more powerful than ferrite magnets Buyer will receive 20 disc magnets per purchase. Magnets will be shipped in a bubble padded mailer or cardboard box.